Written by Dr Muralidaran Ramesh Somasunderam about 9 years ago. I believe the retirement of Muralithran brings to an end a career of a cricketer, whom many will enjoy discussing and debating about at offices, dinners, parties, hotels, restaurants, pubs, and at homes, and whom some will view, analyse and evaluate as a genius, and others will analyse and interpret as a bowler who did not keep within the legal requirements of the game in relation to his suspect and unusual bowling action, even though he was cleared three times by tests conducted in the Department of Human Movement at The University of Western Australia, and the footages, and images of his bowling action also indicate that Muralithran falls within the requirements of legitimacy. Muralithran also did develop the googly for a finger spinner, more specifically a right arm off spinner, where the delivery goes the other way, which extended his arm beyond the allocated limit of 5 degrees for spin bowlers, and 10 degrees was the limit for fast bowlers. Therefore the International Cricket Council did decide to bring the 15 degree limit of an arm being bent by a bowler, pace or spin, prior to its realise, because bowlers, even with model actions, such as Dennis Lillee, and Michael Holding did bend their arm a fair or significant amount based on footage, and images in regard to their bowling actions, even though to the naked eye, the bowling actions of these two great fast bowlers were based on the text book, especially in relation to Dennis Lillee, who had a perfect orthodox pace bowler’s action, such as Sir Richard Hadlee, the late Sir Harold Larwood, and the late Sir Alec Bedser to mention a few important and significant examples. But the point to remember in this instance or circumstance is the deformity associated with Muralithran arm, and from that position to the point of realise is the vital evidence in my view in relation to evaluating the legitimacy of Muralithran as an off spin bowler in both Test Match cricket and One Day Internationals. This is crucial in evaluating and analysing the legal or illegal factor in regard to Muralithran’s bowling action and the style of his bowling. I accept that one cannot coach or teach a young finger spin bowler to bowl in the manner, style, and execution of Muralithran, especially, as he could not straighten the arm, due his disability in his right arm, which he was born with at birth. Therefore this factor must be understood objectivity, when Muralithran is evaluated, reviewed, and analysed, because this is what created the unusualness in relation to his bowling action, and his brilliance, when the ball hit the deck, and what it did thereafter. To me, this was the most fascinating aspect, about him as a cricketer, as no bowler in the history of game did the aspects Muralithran did with a cricket ball in terms of wizardry, uniqueness, and unpredictability, as a finger spinner. Either way, the dialogue or discussion of his legitimacy or otherwise is what makes Muralithran the most interesting and fascinating player to play the game in regard to its history. I believe the unconventional action of Muralithran, in particular his point of release of the ball is his greatest asset, as it came out of his hand at an unusual and wired angel, and its trajectory in terms of its release, and therefore when the ball hit the pitch or deck, it came out as a scrambled seam, rather than the seam being straight. This made it very difficult for a batsman to read Muralithran off the pitch or from his hand, as a batman did not know what way the ball will turn, and even if they read or picked the delivery correctly, most batmen were not in a position to keep him at bay or score runs consistently and quickly against him, which spoke volumes for Muralithran’s ability and uniqueness as a great right arm off spin bowler of class and quality. In my view Muralitheran’s inclusion of a googly in his armoury made things much tougher, and therefore much more difficult for batsmen, as it gave him another dimension in regard to his bowling, including his demeanour and presence as a cricketer. Therefore it appeared logical and easier for batsmen to use their feet against him, but this was much easier said than done in reality, because as many great off spin bowlers before him, he did defeat most batsmen in flight, and through deception of pace, which was Muralidaran’s great asset, apart from spinning the ball a great deal, which is extremely rare, especially for a finger spinner, who apart from spinning the ball, subtle variations of pace, usage of the of the crease in terms of angles, deception of flight and guile, immaculate line and length are essential prerequisites, and therefore requirements in regard to a high class finger spinner in Test Match cricket. This is different to a significant degree in regard to a right arm wrist spinner, whose stock delivery is a wicket taking delivery, as the ball tuns away from right handed batsmen towards the slips, who historically have, and continue to dominate the game of cricket in regard to amount or numbers produced, such as baseball with batters. This is why persons who compare Muralithran with Warne do not understand the game, as one is a right arm off spinner and the other is a right arm wrist spinner, even though wrist spin is a much more difficulty art to master than finger spin. In this regard, I do believe Warne highlighted and showed that he mastered his art of bowling, which was right arm wrist spin, and Muralithran did revolutionise the art of finger spin bowling, with his uniqueness, unorthodoxy, and unusualness. In relation to Muralithran, he turned the ball prodigiously, which was totally different, with his enormous variations, including the googly. This made him a different proposition altogether for a batsman, especially in Test Match cricket, where there is no curtailment of overs in regard to a bowler, and field setting to negate the flow of runs, rather than focussing on taking wickets, based on aggressive, positive, and imaginative filed settings. But even in One Day cricket, Muralithran holds the record for the highest number of wickets taken by a bowler, which makes him extremely special in terms of his quality, prowess, ability, and class. I believe Muralithran was a ‘thinking man’s cricketer’, who understood the strengths and weaknesses of most batsman. He was also persistent, consistent, and relentless in regard in his pursuits of achieving results personally, and as a contributor to a team sport, such as cricket, and he evaluated the conditions and the requirement from his perspective very quickly in important and vital games of cricket, may it be Test Match cricket or One Day Internationals. Therefore he was not just a talented individual, but he brought other facets to the game, especially to a team, such as team spirit and unselfishness, which were invaluable and very much required, and they were greatly appreciated by both team members, cricket officials, and the general public, who were interested in the game, its direction, contribution, and its history. In my view because Muralithran did bowl with an open chested bowling action rather than a side- on bowling action, he did not gain the late drift and curve, which is an essential requirement in harder wickets, such as in Australia and in South Africa to succeed as an off spin bowler at the highest level, which is Test Match cricket. This is why Muralithran’s track record in Australia is poor, and also because he does prefer to bowl over the wickets to left handers, rather than round the wickets, and this was the reason Muralithran was not as potent to left handed batsmen as one would have expected or wished in regard to him, because his stock delivery as an off spin bowler is a wicket taking delivery against a left handed batsman, as the delivery does go away from a left handed batsman towards the slips. He therefore did not use this weapon to great effect, as he should or could, and this is why a left handed batsman of class, brilliance, and ability of Brian Lara was able to play him with confidence, comfort, and ease in Sri Lanka, where the wickets are supposed to be more conductive to spin bowling, than pace bowling, during the home Test Match Series against the West Indian cricket team. I also think Muralithran’s mental strength, the way, the manner, and the approach he played the game of cricket in regard to its correct spirit, principle, values, and virtues made Muralithran a player everyone should admire and emulate, as a fine role model in regard to cricket, and sport in general. 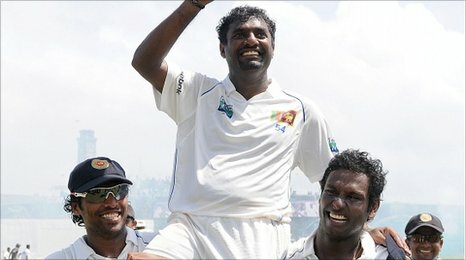 I will wish mention that Muralithran is not only a great son to all Sri Lankans who love and cherish the game of cricket, but a great son to all South Asians who admire the great game of cricket, and to all nations who cherish, value, and play the game of cricket in its correct and indeed sprit, values, and principles. Muralithran will be missed, but his legacy and contribution to the game of cricket, especially to finger spin bowling will be remembered for him revolutionising this art of spin bowling, as he bowled off spin, as a wrist spinner, not as a finger spinner. This I believe is a very interesting and significant factor to understand and analyse in regard to Muralithran. Therefore, he will be remembered for his uniqueness, and unorthodoxy, and in the process changing the discourse, culture, and the approach of finger spin bowling, especially right arm off spin bowling, even though some may question this aspect, especially the traditionalists or purists of the game, who played cricket strictly based on the text book in regard to its technique, its orthodoxy, its Victorian etiquette, and its tradition. This is why some traditionalists and purists may view the late James Laker, who played for Surrey and for England as a bowler who met these requirements, culture, and etiquette, as an authentic off spin bowler of class, quality, and purpose. Nevertheless, I will wish to place on record that all great and original contributors in all sport who were great in their given area or field were mostly unique, and to a fair degree unorthodox, including controversial. Therefore in my view, Muralithran does fit into this category, and his contribution and uniqueness did question the traditionalists and the purists of cricket, that there is not a single way or approach to better an area or aspect in regard to the game, which in this case was right arm off spin bowling. This is Muralithran’s original contribution to cricket, and he was also always willing to challenge himself as a player to better his performances individually, as mentioned and to the team from an overall perspective, as a key contributor who was both proactive and interactive in his roles and participation. Therefore he was a great contributor to the Sri Lankan cricket team, apart from his achievements and successes individually as a player. In my view, Muralithran was a revelation, and therefore must be cherished and admired for his persistence, unorthodoxy, uniqueness, and his brilliance, and in the process to be prepared to be questioned and be queried about his legitimacy in regard to his bowling action. This how history will interpret or evaluate him as a cricketer. I will conclude by mentioning that Muralithran was an individual who has a great deal of honesty as an individual, principle, dignity, respect, and humbleness as a human being, including as a cricketer, and he was as an example to young men and women that one does not need to be arrogant and play ‘gamesmanship’ to succeed at the panicle of their sport, which in this case was the glorious game of cricket. The above evaluation and analysis are my views of a gentleman, who comes from the historical and beautiful city of Kandy in Sri Lanka.